• Above trending topics on the right hand side bar of twitter shows ‘Lists’ features. • You can create your personalized list gathering like-minded people or of your choice. I just created a personalized list of people-i-admire (need to complete). • On clicking the list created, you can ONLY see the tweets of people featured on the list. That helps you look at tweets of like-minded people at a time. •The best part is that you can tweet all the members in the list at a stretch by the handle offered to you by Twitter. 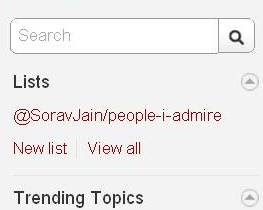 Ex: For my people-i-admire list created, twitter has given me @soravjain/people-i-admire handle. This would help me to inform all the members in the list just by using a single handle. No hassles of tweeting individually. 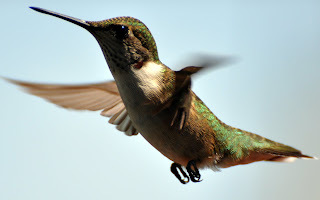 • Amazing feature for marketers to identify and converse with their target population on twitter. • Companies on Twitter can use this feature to list their favorite clients, customers who are active on their online community, contest winners, recommendations, famous employees, team members etc. • On clicking listed you can see the lists you are mentioned on and the lists you follow. 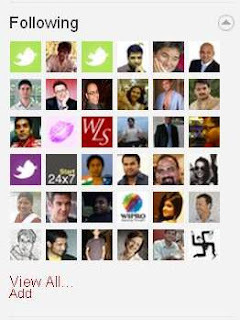 For ex: I am featured in two social media India lists created by @indianterrain and @gauravonomics. •This feature helps evaluate a person’s hobby or position on the basis of the lists the person is featured on. • Make sure you are not black listed. • Number of tweets is now mentioned right below your id / handle. Not moved far, makes your work easier. •Add and View all link is available below the thumbnail following section on the right hand side bar of twitter. • ‘View all’ may not be interesting feature but the ‘add’ link directs you the ‘Find accounts and follow them’ page. • You can use Gmail, Yahoo and your AOL email account to trace if any of your friends are on twitter. • By the way, the ‘add’ feature was only available on the top bar ‘find people’. •Previously there was an arrow indicating reply, many couldn’t understand that (especially new tweeters) Now, you can click on ‘reply’ link. For tweeters who love the old reply icon, you still have that option available. • Similarly, the ‘delete’ link is added next to the bin icon for easy understanding. •Old twitter allowed direct messaging to people following each other. • Now, direct messages can be sent to tweeps even if they are not following each other. 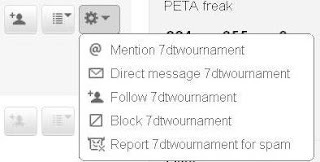 • The only concern is spammers may take advantage of this feature in spamming the direct message box. • But the best part is it allows people to secretly tweet celebrities, politicians, and other personnel they admire (away from follower’s eyes). •On the profile, in-between the ‘follow’ button and the ‘scrolling action button’ now rocks the ‘manage lists’ option. • This feature allows you to get people featured in any of the lists you have created. I liked the way you described new features of twitter. I recent got list invite yesterday and found out I was already listed on four lists. I agree with you that list will provide far many advantages to the users now. And now, I am waiting for twitter apps [Clients] to in-corporate list features in them. Sorav, Thank You for this article. Really Helpful. I am too sceptical about the new 'direct message' option I have mentioned. As, I am unable to track that feature today. Probably Twitter is still on the testing process.